Objective To integrate patient decision aid (DA) delivery to promote shared decision-making and provide more patient-centred care within an orthopaedic surgery department for treatment of hip and knee osteoarthritis, lumbar herniated disc and lumbar spinal stenosis. Methods Different strategies were used across three distinct phases to promote DA delivery. First, we used a quality improvement bonus to generate awareness and interest in the DAs among specialists. Second, we adapted the electronic referral management system to enable DA orders at referral to a specialist. Third, we engaged clinic staff and specialists to design workflows that promoted DA delivery. We tracked the number of patients who received a DA, who ordered the DA, and collected usage data from a subset of patients. Our target was to reach 60% of patients with DAs. Results In phase 1, 28% (43/155) of spine patients and 37% (114/308) of hip/knee patients received a DA. In phase 2, 54% (64/118) of spine referrals and 58% (189/324) of hip/knee referrals included a request to send a patient a DA. In phase 3, 56% (90/162) of spine patients and 69% (213/307) of hip/knee patients received a DA, significantly more than in phase 1 (P<0.0001). In phase 3, both more DAs were ordered by clinic staff compared with specialists (56% phase 3 vs 34% phase 1, P<0.001) and sent before the visit (74% phase 3 vs 17% phase 1, P<0.001). Patients were more likely to report reviewing the DA when delivered before the visit (63% before vs 50% after, P=0.005). Conclusion DA implementation into clinic workflow is possible and facilitated by engagement of the entire care team and the support of health information technology. Although there have been several studies indicating the benefit of DAs for orthopaedic topics,15 16 few describe effective DA implementation in routine practice. Group Health, an integrated delivery system in Washington State, published results of an implementation project that reached 41% and 28% of patients with hip and knee OA with DAs, respectively.17 18 Group Health’s implementation of SDM included clinician training, routine feedback and use of DAs.19 20 However, there are no published reports of DA integration in predominantly fee-for-service systems. Since 2005, our institution has had a programme to promote SDM in primary care, including clinician training and distribution of DAs.21 Our orthopaedic group heard about the programme and inquired about using DAs with their patients. The objective of this quality improvement (QI) project was to test methods of DA delivery to increase the use of DAs for hip and knee OA, lumbar HD and lumbar SS within our predominantly fee-for-service institution. The QI project was undertaken along with a prospective study that assessed patient decision quality and outcomes longitudinally for OA, HD and SS. This project was a collaboration among the orthopaedics department, the Health Decision Sciences Center (HDSC), Laboratory for Computer Science, and 18 adult primary care practices within a large academic medical centre in Boston, Massachusetts. The primary care practices have more than 200 clinicians and medical staff. The orthopaedics department annually sees more than 80 000 patients for a wide range of orthopaedic conditions. Twelve orthopaedic specialists participated in the project—five arthroplasty surgeons, five spine surgeons and two physiatrists. Three specialists, including the chief of orthopaedics, served as clinical champions and spearheaded efforts to promote SDM and the use of DAs. In addition to specialists, this project involved the entire clinic staff for both the hip and knee arthroplasty and spine service, including nurse practitioners, physician assistants, medical assistants and scheduling staff. A patient advisory committee, comprising seven orthopaedic patients, met quarterly throughout the study period and provided feedback on the design of workflows, the outreach and messaging to patients and the type of data to collect. The site has an established electronic DA ordering application embedded in the electronic medical record (EMR) through which clinicians and clinic staff can order over 40 different DAs, including the four used in this project. The ordering application automatically generates a note in the patient’s EMR to document the DA order. The HDSC staff process each order centrally and the DA is either mailed to patients or sent electronically if patients are registered users of the hospital’s patient portal. The clinical referral management system (CRMS) is a custom application within the EMR that is used solely for internal referrals. Each specialty department can require referring providers to answer up to five questions about the patient as part of the CRMS referral. The orthopaedics department agreed to include one CRMS question asking referring clinicians to indicate if they wanted a DA sent to patients upon referral for hip or knee OA, HD or SS. This project was conducted in three phases over about 18 months. Phase 1 targeted the orthopaedic specialists and focused on building their awareness and acceptance for the use of DAs. Phase 2 targeted primary care physicians (PCP) and worked to connect DA distribution at the point of referral to orthopaedics. Phase 3 targeted the entire orthopaedic team and focused on engaging specialists and staff to reliably distribute the DAs. Phase 2 overlapped with phases 1 and 3 temporally, but targeted a different process for DA delivery. Our overall goal was to reach 60% of eligible patients with DAs. We had an evaluation period of about 6 months for each phase, where we tracked the percentage of eligible patients who received a DA. Table 1 details the criteria for patients who are appropriate to receive each DA. The criteria are included in the DA itself, and on information sheets available to the orthopaedic specialists, PCPs and staff when placing an order in the EMR. In phases 1 and 3, study staff had institutional review board approval to screen schedules of participating orthopaedic specialists to establish eligibility of all new patients according to criteria in table 1. The study staff screening was completed after the specialist visit to determine reach, and was not used prospectively to identify patients or trigger DA orders. For phase 2, staff only had access to limited data on all patients referred through CRMS for the target conditions. Previous studies highlight the importance of having an engaged care team who are proponents of DAs and SDM.24 25 As such, the focus of phase 1 was to generate awareness and interest among the orthopaedic specialists for the DAs. Per hospital policy, each department selects a QI project each quarter, and physicians receive a monetary bonus for meeting specified targets. For this project, the arthroplasty and spine clinical champions and HDSC team worked with the QI lead for orthopaedics to design an SDM QI project. The one-time QI bonus was implemented in July 2013 to September 2013. To receive the QI bonus, each orthopaedic specialist had to watch one of the relevant DAs and specialists who saw patients for one of the four topics had to order at least one DA for patients using the EMR application. The orthopaedics department’s QI lead was responsible for sending reminders and encouraging specialists to achieve the targets. Specialists made their own determination as to whether a patient was eligible to receive a DA. To evaluate the impact of the QI bonus on subsequent DA use, study staff tracked how many of the scheduled visits with participating specialists were with patients eligible for one of the DAs from December 2013 to May 2014. Study staff also surveyed all eligible patients, whether they received the DA or not, about a week after the visit during this period. The hypothesis tested in this phase was whether offering an incentive and familiarising orthopaedic specialists with the DA content and the process of ordering DAs within the EMR would be enough to sustain a high level of usage after the formal QI project ended. In phase 2, we worked with information technology (IT) services, orthopaedic specialists and PCPs to adapt the CRMS system to enable DA ordering at the point of referral to a specialist. The clinical champions successfully advocated for the DA question to be one of the five that the department would ask of referring physicians. As part of the referral request, the referring PCP was required to indicate whether a DA should be sent to the patient for the condition of interest by selecting ‘yes, DA’ in the CRMS application. Then, the orthopaedic scheduling staff would contact patients referred through CRMS to schedule a consultation and subsequently would order the DA through the EMR. After the application was programmed, we sent communications to all our adult primary care practices to alert them of the new feature to order DAs within CRMS. We also met with the orthopaedic schedulers to review the CRMS and DA ordering process. From February 2014 to July 2014, we tracked how many orthopaedic referrals for the targeted conditions included a DA request. The referring clinicians reacted positively to having the DA question embedded into the CRMS application. However, two problems surfaced with this process. First, only half of the referrals resulted in a scheduled visit, and second, few of the DA requests were ordered by the orthopaedic schedulers. After meeting with the schedulers, we determined that most of the problems were with the CRMS application itself (which was an IT issue regarding scheduling the visits and out of the scope of this project). We met with referring PCPs and confirmed that they would still want the DA delivered, even if the visit was not scheduled. Our patient advisory committee provided advice on how to introduce the DAs to patients who may or may not follow through with a referral. Starting in February 2014, the staff at the HDSC centrally processed all of the CRMS DA orders, regardless of whether the visit was scheduled and this continued through phase 3 of the project. Despite these adjustments, the CRMS referrals represented a small percentage of new, eligible patient visits to the orthopaedic specialists. Thus, we were still missing a large percentage of eligible patients and needed to develop additional workflows. In phase 3, we worked closely with each orthopaedic specialist and their clinic staff to identify a sustainable workflow to deliver DAs to all eligible patients, ideally before their scheduled visit. The process differed markedly for arthroplasty and spine services. For hip and knee arthroplasty patients, the schedulers built in time to review the clinic schedules and order DAs in the EMR for eligible patients several weeks in advance of their visit. Schedulers were given the eligibility criteria information for each DA (table 1) to guide their orders. Most schedulers did this monthly starting in June 2014. To support the process, HDSC staff sent reminders to the surgeons and staff that included reports of monthly orders by surgeon. Then, we tracked delivery and surveyed patients with OA about a week after their visit from June 2014 to November 2014. For the spine service, it was not possible for schedulers to determine clinical eligibility for the DA. As a result, we relied on the specialists to determine eligibility and indicate which patients should get the DA. We tried several different ways to streamline the process and assist specialists to remember to order DAs for eligible patients during busy clinic sessions. Posters on the walls in each exam room showing the DAs served as a visual cue for both specialists and patients. In addition, we added a prompt to indicate need for a DA on the visit sheet that every specialist completes, and we provided the clinic hard copies of the DAs that could be handed out at the visit either by the specialist, physician assistant or medical assistant. The distribution of hard copies of DAs was tracked by medical assistants using a tracking log. They would place a patient identification sticker in the log when they gave out a hard copy of the DAs. Subsequently, these DA deliveries were entered electronically in our DA distribution database. To further support the process, HDSC staff sent feedback to the specialists and staff that included monthly orders by specialist. We tracked delivery and surveyed spine patients about a week after their visit from October 2014 to March 2015. We used the EMR, the HDSC DA delivery database and the CRMS application to collect information on all DA orders. The title of the DA, who ordered the DA (specialist, clinic staff, primary care or CRMS referral), and date of the DA order were collected. We also tracked the visit date with specialists, patient demographics, the number of referrals with and without a DA ordered for the four topics, as well as how many hip and knee OA referrals resulted in a scheduled visit. For phases 1 and 3, patients were sent a survey about a week after their specialist consultation which collected demographic information, whether they received the DA, and DA usage with two questions: how much of the booklet they reviewed (none, some, most, all) and how much of the DVD they reviewed (none, some, most, all). Our primary outcome was the percentage of eligible patients who received a DA across each phase and by topic. For phases 1 and 3, study staff reviewed charts of new patients scheduled to see specialists to determine eligibility according to criteria in table 1. The percentage was calculated by the number of eligible patients who received DAs divided by the number of eligible patients. For phase 2, CRMS, we calculated the percentage of referring clinicians who indicated ‘yes, DA’ as the numerator and all referrals for relevant topic as the denominator. We also examined patients’ reports of DA usage and whether the timing of the order (before or after the visit), and if who placed the order (staff, referring provider, orthopaedic specialist), had an impact on usage. Human subjects approval was granted by the Partners Human Research CommitteeInstitutional Review Board for the patient surveys and chart review. We had access to demographic information for a subset of participants in each phase (322/463 for phase 1; 253/442 for phase 2; and 327/469 for phase 3). In phases 1 and 3, the sample includes eligible patients who had a visit with a participating orthopaedic specialist. For phase 2, the sample is patients who had a ‘yes, DA’ checked on the CRMS application. The patient characteristics across these phases were similar with no significant differences noted between the three groups (see table 2). In phase 1, about one-third (157/463) of the eligible patients received a DA. A similar percentage of knee/hip (114/308) and spine (43/155) patients received the DA (37.0% vs 27.7%, P=0.19). Most of the orders (75.0%) were placed on the day of the visit and so patients received the DA after the orthopaedic visit. It would have been very helpful to have received the booklet…before seeing the doctor. Reading the booklet provokes my questions I would have asked at that time. I find that my patients who review tools before we meet are able to make the conversation about treatment less fear-based and more rational for developing a plan for treatment. Comments from both patients and orthopaedic specialists suggested that it would be more valuable to receive the DA before the visit. As such, the next phases sought to accomplish that. In phase 2, there were 442 referrals for these four topics entered into the CRMS, 253/442 (57.2%) referrals came with a ‘Yes DA’ request. Specifically, 64/118 (54.2%) of spine referrals and 189/324 (58.3%) of hip/knee referrals included a DA request. Of these referrals, 208/253 (82.2%) received a DA. We tracked the hip and knee OA referrals to determine how many referrals resulted in a specialist visit. Only 189/324 (58.3%) of these hip/knee OA referrals resulted in scheduled visits. The main reasons noted for why 42% of referrals were not scheduled were that patients were referred to the wrong department (ie, referral should be to sports medicine not arthroplasty), the patient was unreachable or the patient declined referral. In phase 3, about two-thirds (303/469) of the eligible patients received a DA. More eligible hip/knee (213/307) patients received a DA compared with spine (90/162) patients (69.4% hip/knee vs 55.5% spine, P=0.02). Overall, phase 3 showed a significant increase in DA delivery compared with phase 1 (64.6% vs 33.9%, P<0.0001). In addition, the timing of the orders differed from phase 1, with the majority of patients receiving the DA before the visit (73.6% for phase 3 vs 17.4% for phase 1, P<0.001). One potential problem with ordering DAs in advance of a visit is that we might send a programme to a patient who is not clinically eligible. A very small number of patients in phase 1 (n=2) and phase 3 (n=6) who received a DA were determined to be clinically ineligible after reviewing the visit note. For example, the patient’s hip pain was due to bursitis or ligament injuries and not OA. Figure 1 presents data on the frequency of orders by specialists, staff and PCPs/CRMS. The majority (107/157) (68.2%) of DAs in phase 1 were ordered by specialists, whereas in phase 3, the majority (170/303) (56.1%) of DA orders were placed by clinic staff (χ2, P<0.001). DA distribution by ordering source. DA, decision aid; PCP, primary care physician. About 70% of patients completed a survey after their visit with a specialist in phases 1 and 3. The majority of patients sent a DA reported receiving it (87.5% in phase 1 and 84.6% in phase 3, P=0.83). Overall, about half of the patients reported reviewing either all of the booklet and/or all of the DVD (50.0% for phase 1 vs 61.5% for phase 3, P=0.07). Patients who received the DA before their visit were more likely to review all of it (62.7% before visit vs 50.4% after visit, P=0.005). This multiphase QI initiative resulted in a significant increase in DA orders for four common orthopaedic conditions. The project had three phases that focused on engaging specialists to order DAs during or shortly after a visit (phase 1), PCPs to order DAs at the point of referral to a specialist (phase 2) and clinic staff to order DAs in advance of a specialist visit (phase 3). Each phase also highlighted systematic challenges associated with routine DA implementation. As such, phase 2 targeted the delivery of DAs to the referral process which was positively received by PCPs and orthopaedic specialists, and was well supported by IT. The use of an IT system to facilitate DA ordering has been noted as a key asset in other implementation studies.17 25 28 While the IT system addressed some prior issues, new ones surfaced. Namely, over 40% of the internal referrals did not result in a scheduled visit, with the most common reason being referral to the wrong department. This finding prompted another QI project to strengthen the referral process (results not presented as the project did not target DA integration). Another insight from phase 2 was how few of the scheduled visits for the orthopaedic specialists come from internal referrals. This study confirms several findings from the two other major implementation projects previously published. As we report here, both the Group Health project in the USA and the Making Good Decisions in Collaboration (MAGIC) programme in the UK found that multipronged efforts that focus on training for clinicians as well as use of DAs were important.18 36 We initially faced similar barriers noted in literature on facilitating SDM and DA delivery.27 A major contribution of our study is a model for a programme that successfully reached a majority of eligible patients which has historically been challenging as reported in past implementation efforts.19 37 While both Group Health and the MAGIC programme have detailed interviews with clinicians, our study adds detailed data from patients that provide insight into the impact of the implementation on patient outcomes. 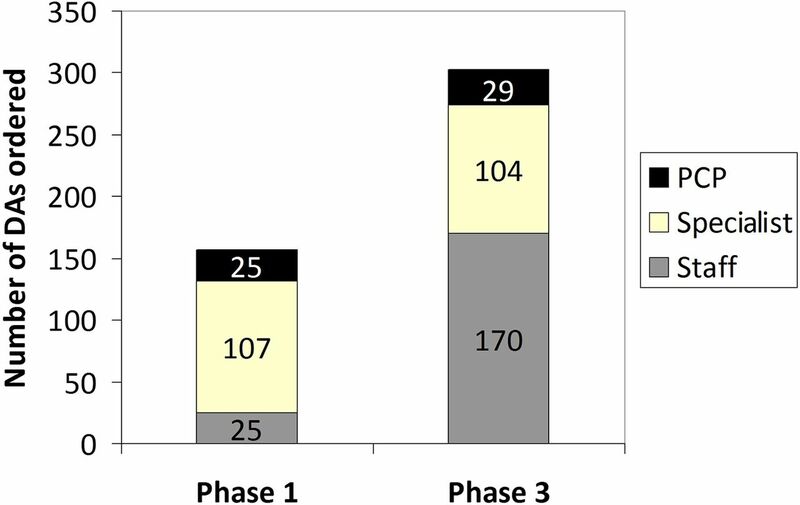 A prior publication, Sepucha et al 38 found that patients who received and used the DA in phases 1 and 3 had better outcomes than those who did not, including higher knowledge, more SDM and lower surgical rates.38 This current paper shows how patients are more likely to use a DA when given in advance of a visit, and the importance of engaging clinic staff in delivery. With an increasing interest in SDM and using DAs to facilitate SDM, by health systems, payers and insurers, successful models for DA implementation are required. This QI project resulted in redesigned workflows which were effective in reaching the majority of eligible patients with DAs for four common orthopaedic conditions. Ongoing efforts are being undertaken to maintain this high level of DA delivery and expand across other hospitals and orthopaedic providers at our institution and across Partners HealthCare network of hospitals and primary care practices. We would like to acknowledge the contributions of the Patient Advisory committee – E Lorraine Baugh, Leigh Baxt, Gerald Borofsky, John Hanify, Rishabh Phukan, Edward Shapiro and Jean Starrett. Also we would like to thank Emma Jeffries for her project support.
. Involving patients in clinical decisions: impact of an interactive video program on use of back surgery. Med Care 2000;38:959–69.
. Shared decision making: advancing patient-centered care through state and federal implementation: National Academy for State Health Policy, 2012. www.nashp.org/sites/default/files/shared.decision.making.report.pdf (accessed 01 Jun 2017). Blue Cross Blue Shield of Texas. Blue distinction centers for spine surgery sm. www.bcbstx.com/producer/resources/spine.htm (accessed 30 May 2017).
. Shared decision-making in Canada: update, challenges and where next!. Z Arztl Fortbild Qualitatssich 2007;101:213–21. Right care shared decision making programme. www.england.nhs.uk/ourwork/pe/sdm/rightcare4/ (accessed 01 Jun 2017). Health Dialog. Population health management services. www.healthdialog.com/ (accessed 1 Jun 2017).
. European experience with shared decision making. Int J Pers Cent Med 2015;5:9–14. Contributors Each author has contributed significantly to, and is willing to take public responsibility for, one or more aspects of the study: TDC, AAF, HER, LHS and KRS participated integrally in the study design. All authors contributed to data acquisition as well as the analysis and interpretation of the study data. MM and KRS both drafted the initial manuscript; all other authors provided critical revisions and approved the final revisions. Competing interests KRS reports grants from the Gordon and Betty Moore Foundation during the conduct of the study; other from Informed Medical Decision Foundation, outside the submitted work. TDC reports grants from the Gordon and Betty Moore Foundation during the conduct of the study; grants from North American Spine Society, personal fees from Bio2, personal fees from GE Healthcare, personal fees from Nuvasive, and personal fees from K2M outside the submitted work. HER reports personal fees from Stryker, personal fees from Ceramtec, personal fees from Lippincott, Williams & Wilkins, personal fees from Flexion Therapeutics, personal fees from Pacira, non-financial support from Hip Society, other from Orthopaedic Technology Group, outside the submitted work. Ethics approval Partners Human Research Committee.